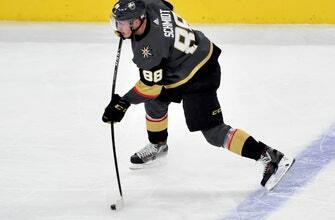 Vegas Golden Knights defenseman Nate Schmidt will miss the first 20 games of the season after he was suspended for violating the NHL’s performance-enhancing substances policy. It’s the league’s first suspension under the policy since Jarred Tinordi in 2016 and just the fifth since the most recent collective bargaining agreement went into effect in 2013. Schmidt, his agent and the Golden Knights criticized the punishment and questioned its merits. Schmidt can take part in training camp, but is ineligible for preseason games. The earliest he can return is Nov. 18 at Edmonton. The 27-year-old Schmidt said an expert in environmental contamination who testified on his behalf at the appeal hearing likened the amount of the banned substance to a pinch of salt in an Olympic-sized swimming pool. Schmidt said he only takes supplements given to him by his NHL team and has never tested positive before. The 6-foot-1, 194-pound Schmidt led the Golden Knights in ice time last season at 22:14 a game. He had 36 points during the regular season and seven during Vegas’ run to the Stanley Cup Final. Schmidt is entering his fifth NHL season after the Washington Capitals signed him as an undrafted free agent out of the University of Minnesota. He has 79 points in 276 career regular-season games with the Capitals and Golden Knights.